With the Windows 10 desktop, while dragging or resizing a window it could suddenly change size and location, or cause other windows on your desktop to disappear. This a gimmicky feature of Windows, called snap and shake that first appeared with Windows version 7. It amuses people who do not have to use Microsoft's operating system to do actual productive work. I find it annoying. 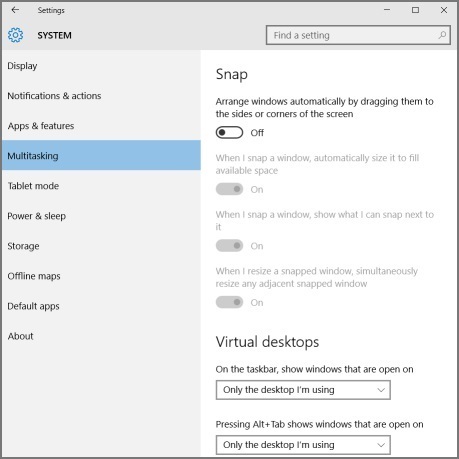 If you are like me and need your desktop windows to do only what YOU want them to, here's how to turn off snap and shake. In the Start menu, select Settings. In the Settings window that appears, click on System to open the System group. In the System windows's left panel, select "Multitasking", then in the right panel, under "Arrange windows automatically by dragging them to the sides or corner of the screen", click on the radio button (round cornered box) to set it to OFF. Now windows will only change size and location when YOU change their size or location.